Although there are several prior Lackawanna County decisions ruling that third party claims and UIM claims may proceed together under one lawsuit in Post-Koken cases, it was held in the recent May 12, 2010 Lackawanna County Court of Common Pleas decision in Mehall v. Benedetto and Erie Ins. Exchange, 09-CV-744 (Lacka. Co. 2010 Thomson, S.J.) that such claims should be severed into two separate lawsuits. 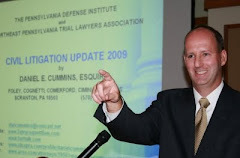 Relying in the Pennsylvania Supreme Court case of Stokes v. Moose Lodge, 466 A.2d 134 (Pa. 1983), which held that bad faith claims could not be joined with tortfeasor negligence claims because there was no common question of law or fact, Judge Thomson ruled that Pa.R.C.P. 2229(b), pertaining to permissive joinder of claims in Complaints, did not support the joining of third party liability claims with UIM claims under one caption in a post-Koken case. Accordingly, the court severed the claims against Erie Insurance and a John Doe Erie Insurance agent and ordered the Plaintiff to re-file the claim against those defendants under a separate caption with a new docket number. One distinction between this case and the prior Lackawanna County cases in this regard is that, in this matter, in addition to the UIM claim against Erie, the original Complaint also contained claims of breach of contract and two negligence claims against Erie and/or the Erie insurance agent. There was no indication in the opinion whether or not the Court was provided with copies of the prior Lackawanna County decisions on this issue before the Mehall decision was rendered. Thanks to Attorney Robert L. Goodman of the Scranton office of the law firm of Forry Ullman for bringing this case to my attention.